For a couple of decades, I have been an “applied sociologist”, meaning that my sociology leaves the classroom and situates itself in organizational contexts. There are many ways that applied sociologists “do sociology”. For the most part, my work focuses on evaluating a range of programs and policies to help organizations get stronger and ultimately, bring in more funds so they can continue to do their good work. Applied sociology may be perceived by some as the step child of academic sociology. “Professor” is a far more classy title than Senior Research Associate or even, Wowza Evaluation Research Expert! But academic and applied sociology are equally good options; the choice to pursue one or the other has more to do with the job market, as well as one’s career goals and interests. That said, applied sociologists have fewer institutionalized steps along the career ladder to achieve “success”, and we certainly experience less institutionalized scrutiny. For better or worse, applied sociologists also don’t generally have a “family” of colleagues for life! A lot of us “applied folks” are happy with our choice. The work is challenging, and the potential to improve programs and policies that improve people’s health, education, incomes and more is satisfying. Many of us also love to teach, but generally when we do, we’re on the lowest rung of the totem pole as adjuncts, with low wages, no benefits and depending on the institution, no status, even if one is a stellar teacher whose students adore you. But unlike adjuncts who are scraping a living together teaching multiple single courses, we may choose to teach a course, without fully depending on this income. This spring, I discovered another way to put my sociology into action, when I joined with a friend to organize a neighborhood music festival on porches, called “Jamaica Plain Porchfest”(www.jpporchfest.org). My type of applied sociology had, for the most part, been stuck in a room, or on occasion, at an event or rally. But I felt ready to break out. While I have been evaluating arts-based programs for a number of years, I found that I could bring my sociological eye to designing and implementing this participatory arts-based musical event. Luckily, I was partnered with an old and dear friend who brought the same sensibility and perspective. Our sociological eyes went into motion from the very beginning of our planning, as we identified the “outcomes” we wanted to achieve for this event. We live in a community that is considered very diverse, in terms of race/ethnicity, class and sexual/gender orientation. But in reality, the community is very divided. There is a “Latin Quarter” which houses Cubans, Dominicans, Puerto Ricans and Central Americans; there are public housing developments that cloister poor people in large high rises; there are new mixed-income housing developments; there are sections of “town” that are entirely working class, and others that are entirely middle class. Our goal was to bring the various strains of the community together – bridging race/ethnicity and class – using music as the vehicle. The phenomenon of “porchfests” is not new. The first one was organized in Ithaca, New York in 2007, and now there are 20 of them in cities and towns throughout the U.S., including Tucson, Napa Valley, Boulder, Buffalo (my home town! ), Salt Lake City and in Somerville, Massachusetts, the porchfest that initially inspired us. From the looks of the incredible photos on each of their porchfest websites, we can see that they are joyous events that build community. From our conversations with the Ithaca and Somerville porchfesters, we also know how successful they are in promoting community bonding, as people come out on the streets to enjoy music together. In contrast to some of the neighborhoods where other porchfests take place, around half of Jamaica Plain’s residents are people of color, including 25% Latino, 14% African-American, and 4% Asian, and 50% are white. Our commitment was to promote bridging and bonding, by pursuing three strategies: include a diverse range of musicians in terms of their racial/ethnic backgrounds as well as their musical genres; locate and include porches throughout the neighborhood where musicians can play; and engage and bring out diverse audiences. We hoped that these strategies would help to overcome some of the “tri-furcation” or “quadri-furcation” (!) in the ‘hood. Initially, we created a Facebook page with a call for musicians and porch hosts. But a lot of people don’t go on Facebook, including 27% of online adults who don’t use social media, and another group of people defined as Facebook “resisters”. So we reached out to local non-profit organizations, some of whom serve youth, others who manage low-income housing, others who coordinate small business activity, and yet others who run programs around maintaining a beautiful, large park in one of the neighborhood’s low-income neighborhoods. We also reached out to students at a highly renowned local music college. We even “scouted” musicians, sometimes at a local park or other venue, as well as musicians we just heard of through friends. My organizing partner and I started with the idea that we’d do a “pilot” event, with three bands and three porches. But if were to stay true to our goals, we needed to do more than that. Ultimately, we had 60 bands sign up, and enough porches committed so that two bands could play on each porch. We spent hours poring over the mix of bands and porch hosts we would match, focusing on bringing together a mix of people from diverse backgrounds, by race/ethnicity, gender, and where possible, class. In the end, diverse bands and solo musicians shared a stage – aka porch – hosted by a third party who generously offered her/his porch. And did I mention that we had NO budget whatsoever? This was one of the appeals of the event. Nothing commercial. No “brought to you by”, banners, logos or even food trucks! We received a few in-kind donations: one from a friend, another from the City of Boston which paid for printing colorful maps of the porch routes to be used on the day of the event, and another from a printer who didn’t charge us for printing postcards to announce the event. For many people, the fact that JP Porchfest was commercial-free was a breath of fresh air. So how did it go? On the day of the event, we had 7,000-8,000 people roaming throughout the neighborhood listening to music, and hundreds showed up at a local restaurant, Bella Luna Restaurant and Milky Way Café, for an after-party which served $5 all-you-can-eat pizza! Anecdotally, it seemed that everyone loved the event from the audience to the musicians to the porch hosts. But a good “action sociologist” can’t just leave it there! We needed to evaluate the impact of the event. In order to count the numbers in attendance, we used porchfest stickers, and had intended to count the leftovers to gauge the size of the crowd, except we ran out of stickers in one hour! We consulted an audience researcher on how to calculate the final numbers, and it’s her figures – 7,000-8,000 – that we are citing. We also distributed very short surveys with a few questions that would help us learn what worked and what didn’t work, as well as to identify the demographics of porchfesters. Nearly 100% reported that the event was excellent or very good (we’re still working on analyzing this data). In addition, we had two sociology grad students from Brandeis University (my alma mater) traversing the event and interviewing participants about their experience. And we queried musicians and porch hosts to provide more detailed feedback on their experiences performing at JP Porchfest, and learned that they made great connections with the other band with whom they shared their porch as well as with their porch hosts. They were pleased that they were able to add people to their mailing lists and increased their CD sales. We also heard that small businesses had increased sales. One of our colleagues and friends from Hyde Square Task Force, a JP youth leadership organization, conducted her own short survey to see if business picked up in the “Latin Quarter”, and interestingly, small shops like the local beauty shop and local rotisserie chicken take-out place increased their business by anywhere from 100-400%! Finally, we wanted to document the event, creating a team of professional filmmakers who shot the event and will produce two videos. One is a documentary about JP Porchfest that centers on three narratives: a long-time Latina political activist who had just moved into affordable housing and wanted to use porchfest as a way to unite her racially divided neighborhood; a veteran rocker musician who writes songs about JP and is a staple in the ‘hood; and a group of youth leaders from a local non-profit organization who were accompanied by two filmmakers who documented their response to the event and the different types of music. The other is a 5-minute how-to video, which will be accompanied by a training guide that we write, in order to help other communities produce their own porchfests! My organizing partner and I were initially worried that no one would show up, and then after the event, we worried that we would experience a post-event malaise. But we have been disproven twice! We are now planning JP Porchfest 2015, this time knowing a lot more than what we knew before we started. Soon we’re going to launch a Kickstarter campaign, and Bella Luna/Milky Way has offered us their venue for two fundraisers. In the end, we determined that we had done a pretty good job, maybe even a really good job! While roughly one-third of our musicians were people of color, we want to increase the diversity of the audience, and we are developing a strategy to do so. In a follow-up conversation I had with Ayanna Pressley, a brilliant African-American City Councilor who spoke at the event, I lamented that the audience wasn’t as diverse as we wanted it to be, and she told me, “you are acting like a woman!” I was startled. What did she mean? She told me that the event was a great success, but I was focusing on the negative. “We’ll work on that for next year”, she reassured me. 1. 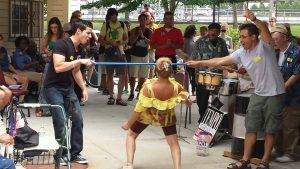 Woman doing limbo at Nate Smith House, affordable housing for elders. Band was Tempo International Rhythm Section. 2. Sterling Rhyne performing at home of Betsaida Gutierrez, housing activist. Photo credit: Sam Sacks.